The incredibly successful Hunger Games trilogy – The Hunger Games, Catching Fire and Mockingjay – has also been delighting fans at the cinemas, with the first two books now transformed into equally successful movies. The Hunger Games: Catching Fire – The Official Illustrated Movie Companion is the perfect book for those fans who want to know more about the process of turning the best-selling book into a movie. Packed with on set photographs, behind-the-scenes information and interviews with significant individuals including actors, producers, directors, set and costume designers and makeup artists, this book is a wealth of Catching Fire trivia and information. What I particularly enjoyed about reading this book was the insights gained about the various details of the movie – casting, locations for filming, costumes and makeup choices and so on. It was interesting to read about the thought processes involved in the various decisions and the effort made to keep the movie consistent with the book wherever possible. The large number of photographs will keep Hunger Games fans happy as they are treated to not only stills from the movie itself, but also red carpet photos of the main actors and more informal photos of the actors on set, both filming and relaxing between takes. There are exclusive interviews with director Francis Lawrence, writer Suzanne Collins, and many of the stars, including Jennifer Lawrence, Josh Hutcherson and Liam Hemsworth, which make for fascinating reading. This behind-the-scenes, insider glimpse into the creation of the Catching Fire movie will appeal to fans of both the book and the movie. 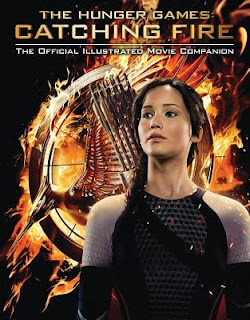 A similar companion to the first movie, The Hunger Games, is also available.